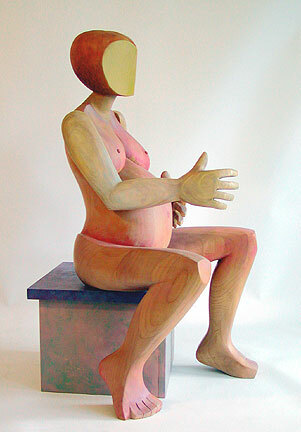 Painted wood, 2005, 18" x 18" x 26". At first I dismissed the thought that pregnancy might explain the subtle changes in my body. I was preoccupied. My days as a recluse had come to an abrupt end just weeks before when my fourteen-year-old stepson arrived for his first summer with us and it was instantly clear that he intended to stay. I had once flirted with thoughts of motherhood but had come to the conclusion that it required a high level of surety and courage that I did not think I possessed. But suddenly I was searching for a bigger place to live and a midwife, shopping for school clothes and baby things, going to teacher/parent conferences and waddling to the top of the bleachers in search of back support while cheering on the junior varsity basketball team. For a person as private as I had been, sharing my home with one stranger and my belly with another, having strangers ask to touch that expanding belly and give me unsolicited birthing and parenting advice felt like an invasion. But one morning, late in my pregnancy, I needed the teenager to help me out of the chair and in time I realized that motherhood is not something you do alone; together we raise my children and yours.